Preheat oven to 400 degrees. Spray a 6-cavity standard donut pan with nonstick spray. ? 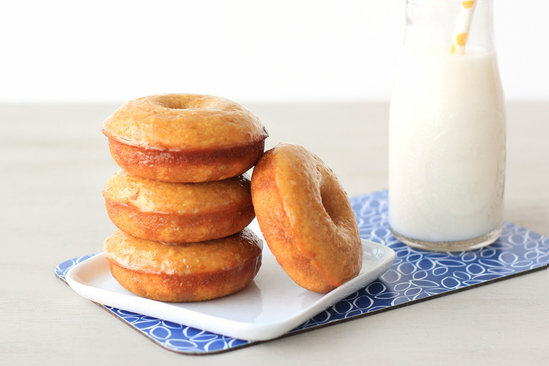 In a large bowl, combine donut ingredients. Add 1/4 cup water, and mix until completely smooth and uniform. 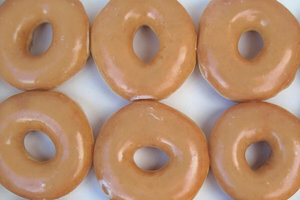 Evenly distribute batter into the rings of the donut pan, and smooth out the tops. (See HG Tip.) ?? Bake until a toothpick inserted into a donut comes out mostly clean, about 12 minutes. ?? Meanwhile, place a cooling rack over a baking sheet. ?? In a medium bowl, combine glaze ingredients, and whisk until smooth and uniform. ?? Return to the cooling rack, and allow glaze to set, about 10 minutes. (Excess glaze will run off; that's why you've got the rack over that baking sheet.) ?